I was provided a product of my choice from Wallternatives to try and review for this post. All thoughts and opinions are my own. Back in April when I attended SNAP! I met the wonderful people at Wallternatives. I remember my friend Ashley from My Craftily Ever After had already heard of them and kinda did a little jig when we walked up. She burst out with all this information regarding Wallternatives, basically leaving the ladies at the booth, smiling and speechless! Seeing as I had never heard of them before, I really wanted to know why Ashley was so excited to see them! After spending some time with them, I learned that have a variety of products, but what stood out to me was their removable vinyl wall decals. Yes, removable wall decals (removable, not reusable). I was smitten with the removable part because seeing as we are renters, this would give me a great opportunity to decorate without putting holes in the walls! 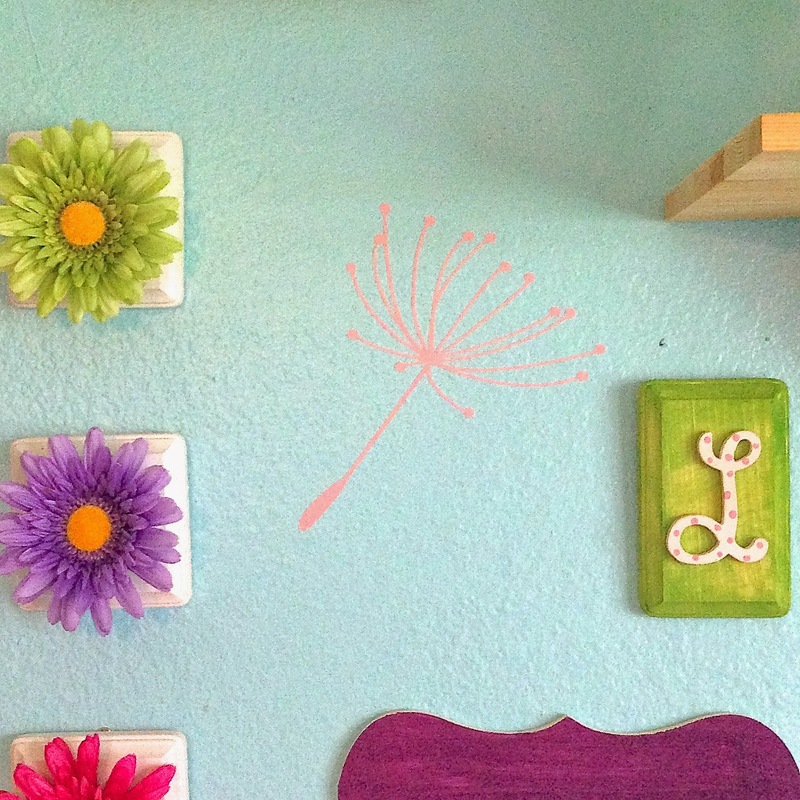 Without giving away too much of Lucy's room just yet (the BIG reveal is coming, don't you worry), I wanted to share with you a few of the Wallternative pieces that I put up for decoration. I chose to review the Dandelion vinyl set because I knew it would go perfect with Lucy's decor, and boy I was right! I mean, what garden doesn't have it's fair share of dandelions in it? After painting Lucy's room a very nice light blue/teal color, I went with the Carnation Pink color for the decals. It was hard picking a color for the decals too because they all looked so pretty and I was nervous about picking one that was going to clash or not stand out enough. The Carnation Pink was perfect, its a lighter, paler pink, which is super pretty. I thought about going with the darker pink, but I think the lighter pink keeps with the whimsical look I was going for with her room. Now, a quick review of how I feel about these vinyl wall decals. They were bigger than I expected. This was not a negative thing, I was actually excited about that, it really helped them stand out a bit more. On application...the dandelions wisps are very thin and delicate. I had to be very careful when applying them. I am not sure why that surprised me the most, I mean, I deal with vinyl and detailed embellishments often, however I was surprised with how careful I needed to be applying these decals. All in all, I really love how they came out and how they really gave Lucy's room a little, extra. These particular decals are priced at $25.95 which is an amazing price for these if you ask me. It's totally something I would have purchased had I not gone to SNAP!, met Wallternatives and signed up for their review opportunity. I can't wait to show you all Lucy's full room reveal! It's going to blow you away...like a dandelion wisp. Super!......I have gained some great experience......Well done! Love it! Turned out great! I pinned some for the kids' rooms once we get to Houston. Love it! Lucy's walls look awesome! I pinned some for three kids' rooms for once we get to Houston.